Secrets: 5 (4 Golden Skulls needed for the bonus Secret). Pierre: Yeah, yeah, Lara will be along shortly have you heard we are getting married. Hey what is this about a Guardian? Pierre: There is more. It talks about the eyes of the skull. Now what do you suppose they are? Go to straight E past the fountain, into the small yard and up the little mound on the right. Climb up into the passage, open the hatch in the end and turn around to climb up to the ledge above. Find the lever E to raise a block in the fountain yard, pick up some Flares from the ledge. Get back down to the ground, to the fountain and onto the block NE. Climb up to a door that will open when you approach, drop down onto the lower floor. Go to the W wall and right around a corner to get the Flares at the end near a gate (bike). Go to a column next to the wall W and climb up. Jump to the column N and up to a ledge there to use the button (a trapdoor opens up). Go into the passage E, over the pit and a blade, the door opens and on the terrace are the Uzis. Jump NE over the fence onto a block below with a little health loss (or go back the way you came) and go into the crawlspace NW. Drop through the open trapdoor. Swim through E and use the underwater lever around the corner past a trapdoor, the trapdoor opens up. Swim down into the open trapdoor and follow the tunnel. Get out SE and pick up a small medipack in that passage, proceed and hop over the water. There is a door left where the floor goes down, and a crack in the opposite E wall, shimmy to the end and use the lever there to open the door, be careful, that blue cloud is toxic. Drop down go to the other side W and into the opening. Turn around to climb up in the end. Go around the corner and into an opening right and drop into a flooded basement. Face the climbable W and shimmy around to the opposite side, follow through over a blade, jump right around the corner at the water (If you happen to fall into the water here. You can just swim S, follow all the way through with a nasty fish on your tail and swim back down into the trapdoor so you can climb back out SE like you did before) and go up another ladder. Pick up the Crowbar from the pedestal. In this same yard is the bike, push the button W, next to the bike and raise a block in the basement. Go back in E, down and to the water. Climb onto the new block and jump up into the opening E, jump to the monkey climb and go get the City Key on the other side. Dive into the water (maybe you had a chance to shoot that nasty fish) and swim E, down the trapdoor and up into the NW opening. Get up into the open door left and follow through. Over the blade and this time climb up W at the end. turn left and go up the blocks to go out a door, Turn right and get down into the yard, through the gate and get the bike. The Bike, the Blood Gem. Drive the bike S, left/right and open the gates with the City Key. Go straight around the fountain and up the stairs to the gate S. Leave the bike for now and go climb up SW to a gate you can open with the crowbar. Push the button inside to open the gates at the bike. Get back down to the bike and drive through the gate. Follow all the way through to a square with a closed gate N. Leave the bike at that gate. Head SE and climb up a ledge in the S, a crow will pester you. Align yourself with the slanted pillar NE, run jump onto that pillar, slide and jump up to the next. Climb up even higher (S) and find a push button in a hole in the floor to the right there. This reveals the Blood Gem on the pedestal and picking it up opens the gates (For the Timed bike run later). First jump SW to get that Medipack from the roof and then get back to the bike. Drive back S to the fountain square. Go E from the fountain, open the gate with the Blood Gem and take the bike in. Follow through over the sloped ground (keep left) and come to a square. Park the bike in front of the left hand ramp S.
Climb up N, jump up, and jump up W (Ah... that gate, let's go as fast as you can!, go to the lever and save there. This is the drill: Use lever, back flip/roll and jump down to the bike, drive up the slope S, go to the right and a left through the gates to the fountain and take a sharp left up the steps S, follow to the gates you opened earlier when you took the Blood Gem. Drive through the next cave-like area to get through the Timed gates into an area with another fountain. Leave the bike and behind the fountain you’ll find a lever you can use. The door in the S wall is now open. Follow through to the next room, it’s the Library where Pierre and Von Croy were talking to each other earlier. Take the Beast Gem from the desk W and use it E (near the NE desk). Go out to the fountain (through the passage up in the N wall) and on the right behind the fountain a trapdoor opened up. Climb down to get Secret #1, the Secret Skull. Back into the library room and climb up on the bookcases NW. There is a transparent opening in the N wall, climb through it and go to the next level. Follow through and stop at the end. Drop to the ground, go NE into a passage, left around and up to where you can jump a bit right onto the top of the rocks to collect Shotgun ammo. Hop back into the opening N and get a Blood Gem near that wall torch. Go back and to the far NW corner of the place, up the ledge and use the Blood gem to open the door. To the left on that ledge is Borchardt ammo, seems the Uzis got switched to Borchardts? Climb up into the door, left around the corner is a lever, open the gates across the deadly pool with it. Jump over and follow through and around the back of the pillar is a lever. A block goes down back in the outside area. First you can go for a Secret, after pulling the lever a trapdoor opened in the pool outside, run out and dive in the pool under the waterfall. 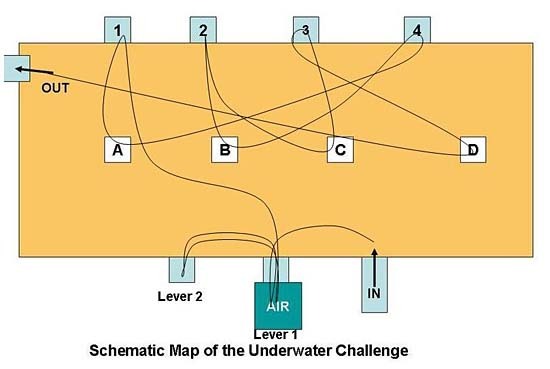 Swim down and straight to the W, and up into the first hole in the ceiling, climb out and get Secret #2, the 2nd Golden skull. Swim back, get out of the pool and go to the far NE corner where you'll find the opening in the E wall. Follow through, shooting some bats and watch out for spike traps. In the back, the SW corner is a Gold Skull over a bowl. Go N and shoot more bats, find another Gold Skull and a last one further into this place, to the SE of it are some Torches, to the NE is a blocked passage (3 blocks). Grab a Torch and ignite it, go back to the three Skulls and burn them. Every burning Skull lowers a block, so now you can go back and enter that passage NE of where you got the Torch. Jump to the rocks on the left and grab the edge, shimmy to the other side. Jump to the ledge to collect the Shotgun. Jump down to the SE. Take a curved running jump (no grab) from the lowest (or the highest) block into the opening NW. Drop down onto a square with a large fountain, go to the pool and turn W into the opening between the lions. Go through the passages to the next underground square, a high place with a push able cage on a block left. We'll have to raise several blocks to get that cage to the other block. Go SE and climb the ladder on the back of that column. When you reach a crack, drop and grab and immediately shimmy around the corner to the ledge. Up here you also have to watch out for spiked traps. Face W, jump across and face SW, jump to the alcove and find lever #1. Climb the block next to the lever (W) for lever #2. Jump back down and go N and jump over that spike trap going W. (Or jump onto the wall NW, then a left curved run jump down to the ledge W) In the SW corner is lever #3, there's also some Shotgun ammo. Go N and jump over a spike trap to find lever #4 near a wall torch in the N wall. Follow the ledge going E into the NE corner on the left against the wall is lever #5, also some Borchardt ammo. Go back on that ledge now going W and stop halfway and look down right. There is lever #6. Jump back up to the ledges and make you way back to the S, to lever #2 (on the block next to lever #1). Face NW and jump to that wall and face SW to jump (grab) into that alcove and use lever #7, jump back and up and use the monkey climb (it is a very long climb all the way around the room) to the end and end up on a column. Turn around and jump SE and from there to S, this is lever #8. Jump back to the pillar N and drop down facing S. Face E and jump to the ledge and grab the crack, shimmy around and climb down the ladder to the ground. All the blocks are raised now in the wall in the middle of the room so start pull/push the cage on top from one end to the other. A door opens up near that large fountain. The exit is N near that wall torch and go back through all the passages. On the left of that water spouting face is the door that has opened (NE). On the next square you’ll find a ladder left of the opening N, once up get the small medipack around the corner and enter N. Approaching the pool directly will kill you, so go around to the back and use one or both levers. Block(s) go down in the walls next to the pool so you can dive in safely and get Borchardt ammo and the Beast Camber Key. Get out of the pool at one of the blocks again. Get out of the room, down the ladder and jump on a block NW, turn S and jump higher and get a Medipack. Back to the ground and go NE into the opening between two wall torches. Use the Key there. Now go SE and back to the previous cave, the open door is in the S wall. Go into the SW corner under the door, jump up SE onto the rocks and enter. Shoot bats and slide backwards into the pit, let go and loose a bit of health. Another safety drop, facing S and from the left side drop on a green block. Jump down and get the Medipack SW. Follow through up a slope and slide down into a larger area. Go to the NE and up a small ramp, turn left and follow this passage to the end. On a pedestal are some Borchardts, next to it is the Beast Key. Grab the pillar N and and pull up E. Hop up SE, and run jump over the burner tile to the SE, climb down the ladder there and use the lever (to open a door on top of these blocks, leading back to one of the fountain squares, this is for later). Get back down to the floor and out to the dark cave, left around the corner into the opening between the wall torches (E). Place the Beast Key left around the corner and the cage opens up. Three beasts will show up, don't shoot while they pound their chest because you will be wasting ammo. Inside the cage is a Torch. Grab that, ignite it and go out to the cave, first go W into a similar cage to get the Medipack there. Back out to the cave and up the ramp NE, right around the corner is a wall torch, ignite it and drop the torch to shoot that beast. Go into the opened cage and get the Guardian Gem. Go out and right (N) back into the room with the blocks and make your way up to the top of the stack. Through the door you opened before. When back in the fountain cave go up that ladder NE again and go into the room with the deadly pool, around the pool to place the Gem SW and find the transparent opening W. Climb in there and follow through to get to the next level. Follow through, pick up Borchardts and ammo and run over the breakable tiles. Keep going and run towards the closed gate. This will open a door a bit back N, so go in there. Keep going down a slope and at the end go to the N wall (a bit back from the gate) and use the lever on the block there. Jump down and go back up the sloped passage (W), as the other gate opened. Once inside, you'll encounter some Crows. Go to the N wall and into the opening near the NW corner, go up the ramp and find some Flares. Follow through to a square and kill the 2 tigers. Go right around this building and find the Shotgun ammo at the SE corner, enter the opening E, follow all the way through and you’ll get in the top of the main room. Grab the Shotgun ammo bit further on the bridge (the Secret skull is out of reach on a ledge E) and use the rope to swing over to the W. Go S and to the ledge there and jump to the walkway on the wall to the N. At the end look NW and take a curved jump into the opening there. Use the lever to raise a block, drop down and climb down the ladder. Climb back into that tunnel N and follow through, right around the building again and in the far corner is that block you saw in the cut scene. Push the cage once and use the lever, gates open up on the bridge. Go out, through the E opening to the upper level of the main room and the gate that opened is straight ahead. Enter the next big hall and left around the corner is some Borchardt ammo. Hop down to the ledge on the left and straight ahead is on a ledge S is some Shotgun ammo. Back down to the ledge, walk to the edge and use the binoculars to spot a small block on the ground floor, go to the ledge and make a safety drop onto that block. Go to the S and the door there opens, shoot the two beasts that run out, one will drop a Medipack. Use the lever in the room they came from, this closes a door in the ladder of the main room and will also open the door W in this room, go in and climb higher and higher. Now go to the E and look SE, see that ledge... jump there. Position Lara with her right shoulder one tile away from the wall, aim for the ledge and take a running jump with a slight curve to get on the ledge. Watch out not to aim too tight or else she will bang her head. Go into opening S and save after the steps. Take a running jump and grab the tile, hoist up and a running jump and grab to the next, one more to get to the other side. Use the lever to open up another gate in the main room. To get back you can use the monkey climb over the pit. Down the steps and out on the ledge in the hall you can do the same kind of jump you did earlier, this time to the left to get back to the ledge NW, head N through the open gates to the stone second bridge in the main room. Go left and jump to the walkway against the W wall and again NW into the opening there. Use the lever again and see a gate open up in the big hall. You can do a run jump out to the right and land back on the walkway, go jump to the ledge S and through the gate S into the big hall, to the right is the gate you just opened. If you can’t make that jump you can also go down the ladder, go into opening N and around the building into the E opening. Once on the bridge use the rope to get to the other side (W bridge) and go S. Jump down right, go through the gate and up the stairs, find some Flares on the right, keep going W till you see a pit. Use a flare and throw it, there is an invisible tile in the middle. Jump over and enter the opening and kill the beast and then use the lever N to close the second door in the ladder. Go back the way you came and to the stone bridge in the main room. Jump from the bridge down into a pool SW, go up the rock under the ladder and climb the ladder into the third open door. Use the lever and get back to the bridge, I just jumped (with grab) and lost some of health (The intended route is down the ladder, through the tunnel N around the building into the opening E and with the rope to the W side bridge). The gate N is open so go in there, face S at the pit and climb the ladder, around the corner and down. Use the lever and back up the ladder again, a block appeared at the pit. Now you can use the ropes so swing to the other side (use the pillar as a first stop). Follow through and shoot two tigers in a place where you'll find the Guardian Gem on a pedestal in the E. Go around through the back to get to it. Just around the other corner from the pedestal you can find a door that has opened in the E wall. Follow through and the door at the end will open. You’re back on the square with the building, go SE and into the building, follow the tunnel down to the ground floor of the main room. Climb the ladder W to the top and climb off to the left. Jump down and jump to the ledges S, wait up a bit and kill two birds there, then jump diagonally (no Ctrl) to the tip of the NE ledge, then jump SE, go left into the building and get the Guardian Thistle (make a note of the symbol behind it). Step out and turn left (E) a door at the end is open (later). Left around the building is some Borchardt ammo. If you want the next Skull, don’t go into the door just yet. Jump to the ledge E of the building look down. Be sure you have enough health and slide down and then jump to the ledge with the pedestal. Once there get the Medipack and Secret #3, the 3rd Golden Skull, top up your health again and safety drop down to the ground floor facing N go to and climb the ladder W and jump the ledges back to where you got the Thistle so you can now enter that door SE. Slide down, follow through and climb down as far as possible on the ladder to safety drop in the passage you’ve been before. Go down the slope, place the Thistle and kill the beasts. Enter and run around the structure and place the Gem in the back. Remember that symbol when you took the Thistle, it's on the S wall. Climb through it and slide to the next level. You slide down into water, climb out anywhere, as the slopes are fine to walk on. I went SE and shot the beast NW from there. Go over to where the beast was and from the NW corner start climbing that tomb. Get around to the NW corner of it and face NE, jump around to a ledge over the wall torch and climb the ladder to the top, hang from the edge and shimmy left or right before pulling up. Jump up to the pedestal where you'll find the Cistern Key. Get down to the water.Get out SW and use the Key there. The Cistern, the Garden Key. Go into the gate around the corner, up a slope and up some steps and go left (S) at the end. There are 4 blocks with vases in the corners of this large Cistern, go around and shoot all 4 of them, this opens a trapdoor on top of a ladder S. Climb the ladder and use the lever, the room is flooded now. In the W is a small medipack and over the top of that structure you can get out and there is an opening N. Go left and around a corner and another corner and climb up S to get the Garden Key. Jump down and retrace your steps and near a wall torch (NW) is an alcove. Jump in and use the crack to the right to shimmy right around the corner and get into a small room, jump the pit and enter the door. Slide down and in the next room jump down to the top of that structure to get the Torch. Slide down to the floor and light the Torch on a wall torch, go to the N side and ignite the wall torch there (screen of an underwater gate). Take the Torch with you to the exit is SE. Follow through and go left, down the steps and the slope till you’re back at the main pool. Wade into the water and Lara will swim with the Torch. You have to go to the E (you can also let Lara wade on the slopes, that is a bit faster than swimming) and from there go to the SE. Drop the Torch and use the Garden Key there. Get the Torch and enter, go E and ignite the wall torch near the opening E (underwater gate opens now). Drop the Torch and enter the opening E. Go right a bit and hop onto the corner of the tomb, from there hop into the safe spot between the spikes in the water. Get the Chasm Key and the spikes will lower. Get out and leave (NW) to the main pool, get to the W side of the pool, get into the water and face E to swim into the opening under the tomb (gate opened by igniting the two wall torches). Pick up the Secret Key. Swim back out, go right (NW) and use the Chasm Key on the gate there. Enter and follow through till you end up at a deep pit. Jump up the block N and from there a running one to the opposite side (watch your head), shoot the bat and continue to jump the blocks and shooting bats. The gate opens up, jump to the ledge in front and enter. You have to stand on/jump over all 4 spike tiles in the corners, that will extinguish the fire on top of the structure. Jump on to the top and get the Fountain Key and leave through the same door. Jump the pit again and go to the main pool. Make your way to the E side. The Fountain Key goes in the E (on the right of that structure) climb the ladder in the corner and shimmy as left as you can when you are almost at the top, back flip and jump with a curve to the left. Jump down and go step carefully onto the green tiles with the flames. Each tile triggers a beast, shoot those and now you opened three gates up in the walls. Shoot the 3 vases inside W, N and SE with your Shotgun (aiming with the “look” key). This opens the gate S. If you're out of Shotgun ammo, stand on the higher green ledges, jump and shoot and for the lower green ledge, back flip onto the slanted block behind it, jump and shoot. Go into the open gate S, rab the Pool Key there and return to the exit SW, climb the block to the right and back flip onto the slope, slide and jump to grab the ladder and climb down, head back to the main pool again. Dive in and swim to the right (NE) to use the Pool Key there. Get in and in this room you'll have to push the 5 cages in the alcoves around the pool to raise a block W so you can get to the ropes. Swim into a crawlspace in the NE corner, time the spikes and use the lever to raise a block behind the first cage. Get out, climb out at the middle cage N and push it onto the trigger tile in the back. Now you can do NW / NE / SE / S and the block W goes up so you can get to the higher block. Use the ropes to swing over to the E, go up some steps and come to another challenge. From the somewhat elevated floor at the 4 corners of the structure you have to jump onto the corners of the spike/fire blocks, immediately side flip and in case you burn, roll in the shallow water. When you did all 4, the burner at the N side of the structure is gone. Jump to the top of that structure from the N and grab the Tower Key. Go back to the main pool area, into the water and go right to the W side. Walk up to the floor and use the Pool Key left. Go in and follow to where a flyby shows you the Tower. Go left (W) and take a right around the wall torches and use the Secret Key there. That gate between the wall torches is now open, go in to get Secret #4, the 4th Secret Skull (you have all for the Bonus Level). Go to the N side of this tower and climb to the top of the ladder on the N wall, back flip and roll/grab then shimmy to a corner, hoist up and jump inside. Go to the right (W) and shoot that beats on the ledge. Slide down to jump and grab the ledge where the beast was. Pull out that cage and to move it to the side to use the lever in the passage. Drop down to the floor and climb the ladder again and again back flip and jump in to the Tower. Once inside look up and climb that ladder and climb off to the left. Jump and grab into that opening S, jump to the 4 corners of the pyramid and shoot the 4 vases. Go to the SE and climb up, use the monkey climb to the W and grab that Medipack. Jump back to the monkey climb and now go to the top of the structure, drop when the flame is down and stand in a corner. Go to a far corner when it is safe and then jump forwards with a grab to hoist up in the passage. W wall are 3 doors, from left to right: entrance, air hole and lever. Swim in and go left around the corner, into the first tunnel left (W=air hole), climb out and use the lever on the wall to open the next lattice door. Swim back and take a left and another left into the lattice door you opened and use the lever in there (the sea hag appears). Swim back to get some air (right and right). Swim back out and go to the opposite side to almost the far left corner (NE - door #1) and use another lever there. Roll and swim out and a bit right to swim up to the ceiling and into the opening (Opening #A). Hoist up and get the small medipack near the wall torch. Use the lever and back into the water and swim S along the left side into the opening (E- door #4) and use the lever. Then swim N and up to the opening in the ceiling (opening #B). Get the small medipack and use the lever. Back to the E wall and use the lever in door #2, this opens ceiling opening #C.
Shoot the beast and again use a lever. The last door E is door #3 and the last opening is #D (S) In this last room are a beast and a small medipack. Use the lever and swim all the way N, as that lattice door will now be open. Climb out and kill the Sea Hag. N side of the room is a wall lever, opening a gate S, go through it and slide down. Level 5 - Return to the City. Go through the symbol into the Library, go straight over the ledge and a bit left into the opening N, follow through to the fountain. Go behind it and use the lever to open a door W, follow through and you are back on a square where the bike is. Take the bike through the passage N, ending up on another fountain square. Go left around the corner into the passage there and leave the bike at the corner where the table is. If you have them, use the 4 Skulls next to that gate W and go in to get the Master Secret Finder reward and get out. Go back S to the fountain square and into the opening S, all the way to the end where you'll find Torches. Take one and ignite it at the lamp, set fire to the lamp (#1) in the other side of the room and head back to the fountain square. Go into the tunnel NW you came from with the bike and find a second lamp (#2) around two corners, ignite it. Back to fountain square and into the passage SW where the bike is and immediately right around the corner is a lamp (#3), go N and right around the next corner, next to the table and chair is the next lamp (#4), go through E and left around the corner is the last one (#5). The door S here opens up, go in and shoot that grate up E. Get in there and follow through to a street, follow the street and get a Medipack, Shotgun ammo and a Revolver, this opens the next door. Drop into a sewer system, 2 beasts attack. After the battle you can gather Borchardts, 4x Borchardt ammo, Revolver ammo and a Medipack in this first section of the sewer. Next section has Borchardt- and Revolver ammo. At the crossing 4 beasts attack, two drop small medipacks, a third the Golden Key. Use the Key at the E wall and climb up E, drop onto a square and collect a Medipack and Shotgun ammo. A T-Rex will come for you, shoot it once or twice in the soft belly from real close. Go through the squares to find three levers and the door on the first square opens up. Go through and up a ladder to where you can now pick up the Guardian Gem. Slide down S and go W where you can use the Gem on the door NW. Lara sweetheart, where have you been, you’re soaking wet. Did you sort out the Guardian? You're soaking young lady. Are you tired?